Chachkacard sells greeting cards. 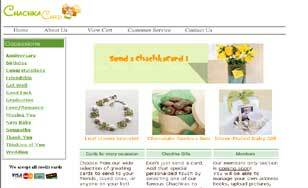 The E-commerce web design by Botochon enables customers to browse a wide selection of cards for different occasions. Additionally, customers can view both the inside and outside of the greeting cards and send a personal message inside the card. The site automatically accepts orders and processes credit cards, while customers also receive confirmation emails. The site features an easy-to-use administration interface so that revisions can be made to content as needed.